I’ve been in Paris – can you tell? Give me twenty-four hours in France and I start coming out with all of the bad franglais. Actually (and I’m very proud of this) I always get lots of compliments about my very authentic French accent whenever I’m in Paris. Unfortunately I only know one sentence – the rest of my French is a mish-mash of incorrectly used verbs and nonsensical sentence structures – and so they soon retract their compliments when they realise that I have the vocabulary of a two year old. Whatever; Sac de Secrets sounds all kinds of enticing. Fancy a delve inside? I had absolutely no idea what was in my handbag before I started filming and so the whole video was kind of risky, but I had accidentally deleted half of the footage from the serious skincare video you were supposed to get and so I had to just take le plunge. 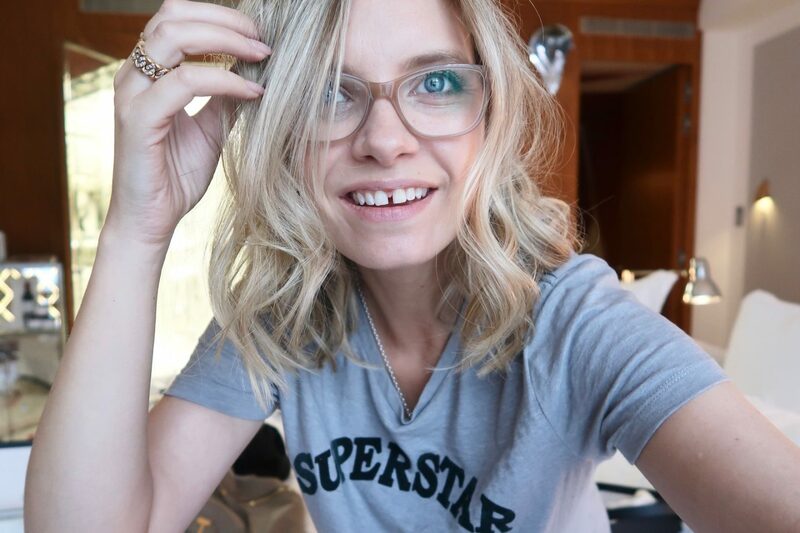 And so if you want to see my Wayne’s World impression, find out what I bought from Gucci and hear what I think of Charlotte Tilbury’s eye quads then press that play button – you can find more info below the video pane. I shot this video in my room at the Raffles hotel in Paris where I had the noisiest neighbours you can imagine – they had a party until 2am, quick break at the bar downstairs and then back up to their lair to make more noise from 5 until 7. I hated them with a passion and wanted to smash my fists on the wall, but when I managed to get a glimpse of them in the corridor through my spy-hole one of the blokes looked like he might be Mafia. Admittedly the 70s Mafia, because he was in a bright white flared suit with his black shirt undone to the waist, but still. You can’t be too careful these days. I mean maybe he was actually an Elvis impersonator or something, but I wasn’t going to take the chance. Being sent to sleep with the fishes or serenaded with a hammy rendition of Suspicious Minds are two very different outcomes. You can definitely do a few more videos like that! You’re just such a funny and entertaining woman, it’s fun to watch! Silicone earplugs. That is all. We love you Ruth. These are some of my favorite of your videos. I LOVE LISTS, they are my life and I feel super organised. Honestly, getting out of the bath was an emotionally scarring experience. I saw things I’ve never seen before. Wow, I’m impressed about your authentic French accent! I love ALL your videos so much!! It’s better than SNL lol! Really you are witty and funny! Keep em coming!! I live in the US. San Francisco Bay Area. Can´t be careful enough, the 70s mafia is bad enough, even if they wear white. I’m intrigued by the metal log?…. Ah, forgot to photograph it!! !